Compare discounts for Hotels Motels in Atlanta, Georgia! Home to the Centennial Olympics, Atlanta, Georgia has experienced unprecedented growth in recent years. Atlanta is a major banking center and is hosting the headquarters for such companies as CNN, Coca-Cola, Delta Airlines, Holiday Inn Worldwide, and UPS. Hartsfield Atlanta International Airport (ATL) is one of the nation's busiest in daily passenger flights. Dozens of dazzling skyscrapers dominate the Atlanta Skyline. From Downtown via Midtown and Buckhead to the outer perimeter business districts Atlanta is a modern prosperous city. Atlanta is not only a major business center, and the main metropolitan area in the southern US, it is also a great tourist destination. With the Olympic park at the center of it all, Atlanta offers such attractions as the Coca-Cola museum, Underground Atlanta, the CNN center, Stone Mountain and Six Flags over Georgia. Note: Lists are not identical. 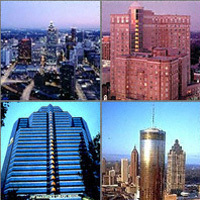 Different sites offer different accommodation options for Atlanta. The JW Marriott Hotel Buckhead Lenox is ideally situated in the heart of Buckhead, Atlanta's prestigious business, cultural and entertainment district just five miles northeast of downtown. Hyatt's 23-story flagship atrium hotel is located on Peachtree Street, in the heart of downtown, with shopping and dining in adjoining Peachtree Center. The Westin Peachtree Plaza Atlanta is ideally located in the heart of Atlanta business and financial district. Connected by skywalk to Peachtree Center Mall, the Atlanta Marriott Marquis, Atlanta's largest full-service hotel, is offering a level of service unsurpassed in the Atlanta area. The Atlanta Perimeter Hotel Suites is a new hotel opened in 1999 at the Perimeter Center upscale northern suburb of Atlanta. The distinctive Grand Hyatt Atlanta Buckhead hotel combines elegance, unsurpassed service, and savory cuisine to offer discerning guests Atlanta's legendary hospitality. Located in the heart of midtown's corporate and cultural activities, the Atlanta Marriott Suites Midtown is opposite One Atlantic Center and Promenade Towers and within easy walking distance of the Arts Center MARTA rail station, High Museum of Art and the Woodruff Arts Center. Downtown Atlanta is just two miles south. With the magnificent Midtown Mile to the left, picturesque Piedmont Park to the right, world-class culture next door, the hottest clubs in the zone and specialty shopping everywhere, you’re in the middle of it all at the W Atlanta - Midtown. Westin Atlanta North at Perimeter Center is surrounded by acres of Georgia woodland overlooking its own private lake, less than 30 minutes from downtown Atlanta, GA. The Atlanta Marriott Perimeter Center is conveniently located thirteen miles north of downtown in the Perimeter Center Office Park adjacent to Perimeter Center Mall. The Georgian Terrace hotel is a first class hotel, located in Midtown Atlanta, just srteps from the heart of downtown. Hilton Atlanta Hotel offers convenient downtown location with superb accommodations and amenities. The Sheraton Atlanta is centrally located in downtown Atlanta near the Georgia World Congress Center, area attractions, and restaurants. The newly renovated Sheraton Buckhead Hotel Atlanta is located in the city's most prestigious business and shopping district, just steps from Lenox and Phipps Plaza malls. Located in trendy Midtown and less than one mile from downtown, the Wyndham Midtown Atlanta offers a blend of Southern charm and continental elegance.